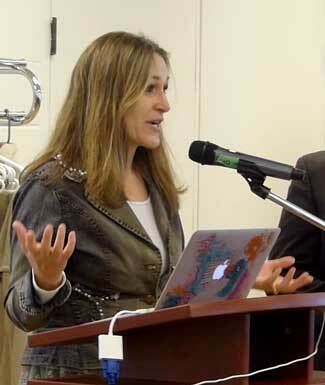 Mayor Marianne Meed Ward at last year’s Transit Users’ Forum. 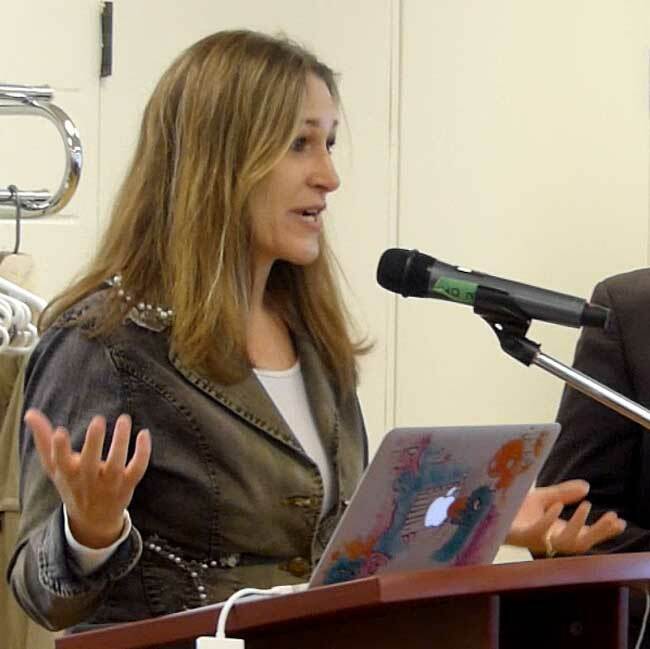 Mayor Marianne Meed Ward has signalled that she will propose the re-establishment of a Transit Advisory Committee, chaired by new Ward 4 Councillor Shawna Stolte. It will be a rebirth for the Committee, which was axed by the old City Council and supposedly rolled into the Integrated Transportation Advisory Committee (ITAC). But nothing useful on trabnsit ever came out of ITAC. BFAST made the re-establishment of the Transit Committee one of its key proposals in the civic election. As reported in The Burlington Gazette, the Transit Advisory Committee will be part of a shakeup of the City’s advisory committees that the new Council must approve. The Mayor is recommending that the transit committee will cooperate with the Cycling Advisory Committee and the Integrated Transportation Advisory Committee. This entry was posted in BFAST News on December 17, 2018 by Collin Gribbons. Transit advocate Jim Young (left) thinks free off-peak transit for seniors is a winning issue for Burlington’s new City Council. In a previous op ed for The Gazette on the “First Hundred Days” I asked for patience and realistic expectations from a new council. Most of the issues that gave rise to the electoral shake up at Burlington City Council are simply too big and complex to expect them to be resolved in the first hundred days. The “adopted” Official Plan, changes to the Downtown Mobility Hub and the missing transit and parking plans all require significant work by staff and review and reconsideration by council. They may also require Regional approval and compliance with provincial legislation. So while work on these gets underway in the first hundred days, don’t expect quick results on these portfolios. Given the last fiasco on the OP, we should be demanding that council and staff take appropriate time to seek our input and get the OP right this time. 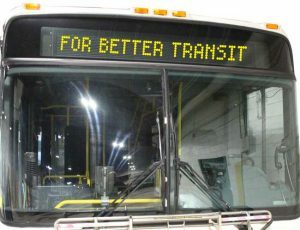 However one immediately winning issue that can be achieved as a simple 2019 budget amendment, is free transit for seniors during off peak hours (10.00 to 2.30 Monday to Friday), an idea whose time has surely come. This was originally proposed by Burlington Seniors Advisory Committee (BSAC) in 2016 for the 2017 budget and defeated by 6 votes to 1. 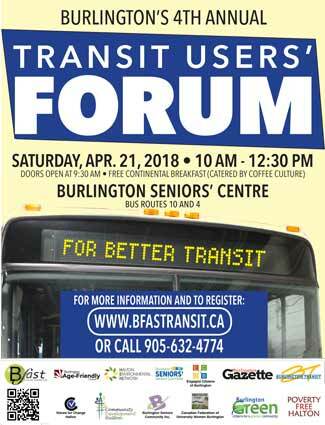 The idea is detailed in BSAC position paper “Improving Transit for Seniors Improves Transit for Everybody” and has since been adopted by Burlington for Accessible Sustainable Transit (BFAST) who support the idea and for other disadvantaged groups and as part of a more comprehensive long term transit plan. 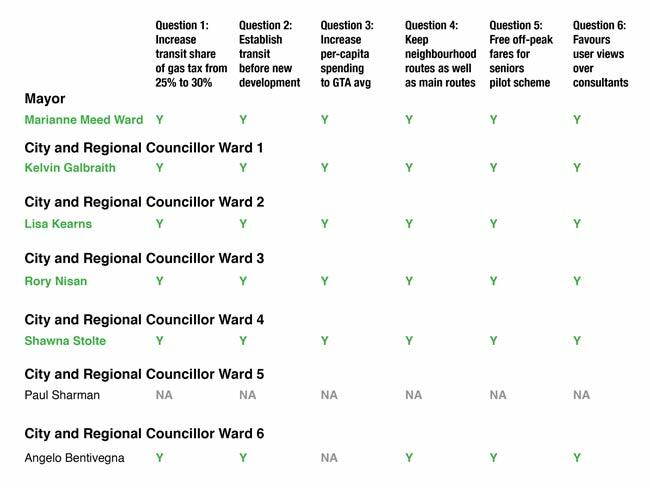 In the BFAST 2018 election all-candidate transit survey, all six Councillors elect and Mayor-elect indicated support for the idea, some wholeheartedly, some with qualification, suggesting it might be expanded to other disadvantaged groups. The buses already run empty during those off-peak hours so the only cost is an amount of lost revenue and that is not overwhelming. Based on figures supplied by Burlington Transit in 2016 I calculated it might cost between $48,500 per year and $72,750 depending on the rate of uptake. The previous Director of Transit agreed the cost for a one year trial would be less than $100,000. In an email to me his biggest concern was that any trial would prove so popular, it would be difficult to repeal. It is less than one half of one percent of the city transit budget. It is possible that provincial funding for transit, a complex formula based on ridership (not revenue) might increase enough to offset any loss of revenue. 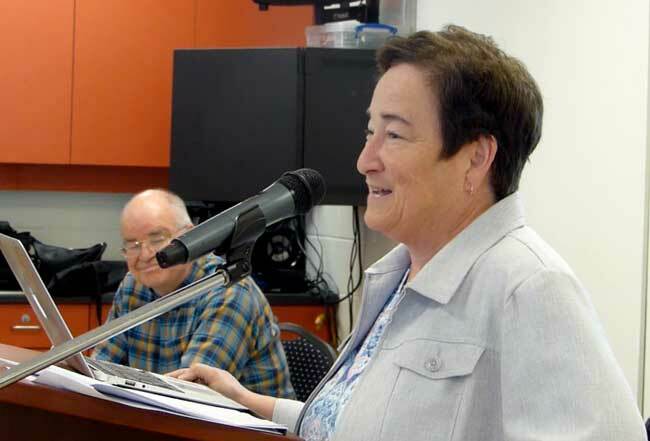 Perhaps Transit Director Sue Connor, who has won the respect of city staff and transit advocates equally, can provide updated figures for the cost, the potential provincial funding increases and whether there might be an overall gain for Burlington Transit. As well as filling our mostly empty, off-peak buses the “Improving Transit Paper” details the impact of reducing traffic congestion, improving road safety, reducing CO2 emissions, providing a dignified alternative for drivers who lose their drivers license to age related issues. It also outlines some economic benefits for the city and local businesses and the health benefits to seniors who suffer from social isolation. BFAST events that bring citizens up to date on transit events are always well attended. Might they be heard by the new city council as well? So come on Mme. Mayor and brand new Councillors. What are you waiting for? This will help fill the buses, reduce traffic congestion, improve road safety, provide economic benefit for local retailers and help improve the health and well being of our seniors; all of which i’m sure were on your platforms. This is a win – win – win for Council, for Burlington Transit and for seniors. It is also an opportunity to demonstrate that our new council listens to our citizens and delivers on its election platforms and positions. Burlington for accessible Sustainable Transit (BFAST) says the results of its candidates’ survey on transit policy could mean a change for the better. The group surveyed all Burlington mayoral and council candidates and endorsed Marianne Meed Ward for mayor. BFAST welcomed the priority that both mayoral city council candidates are giving to transit in their survey answers and platforms. Thirty-three of the 37 candidates favoured establishing transit service before new developments were built. Twenty-nine favoured a pilot project offering free transit for seniors during off-peak hours, a proposal the present council defeated 6-1 in 2017. The year previous, council had voted 4-3 against a pilot project to give seniors free rides on Mondays. The survey was conducted by email in late August and early September. All 37 of the mayoral and council candidates submitted responses. In some cases, the responses came with extensive comments, which BFAST published in full. Email addresses for the candidates were obtained from the city’s election website. 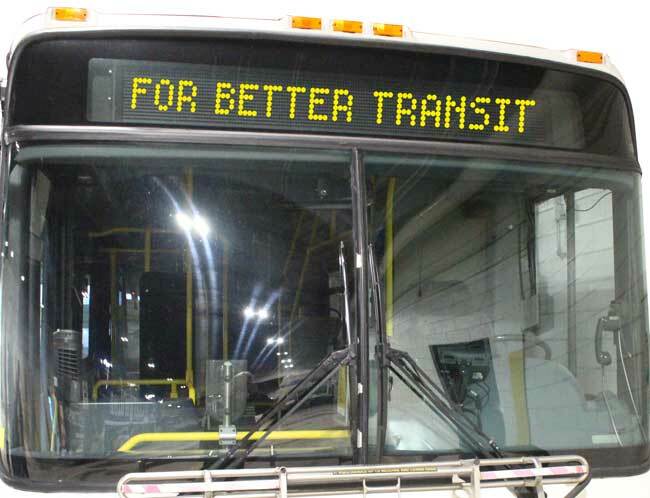 BFAST, established in 2013, is a citizens’ group that promotes public transit in Burlington. 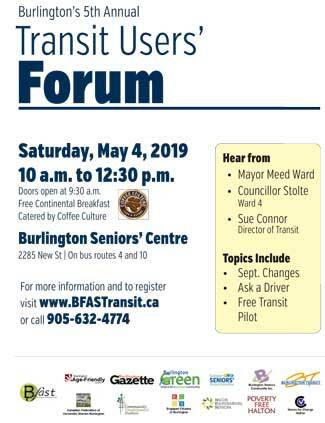 It is the lead organizer in the annual Transit Users’ Forum, delegates to city council and staff, provides information to transit researchers and works with other community groups to improve Burlington’s transit system. This entry was posted in BFAST News on October 2, 2018 by Collin Gribbons. 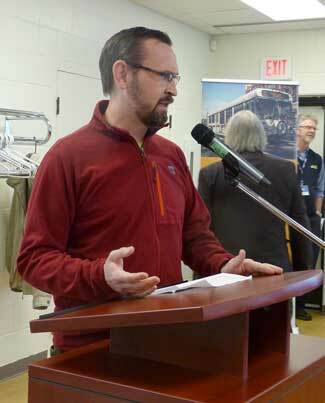 Burlington Transit Director Sue Connor makes a point during her presdentation as BFAST Chair Doug Brown looks on. 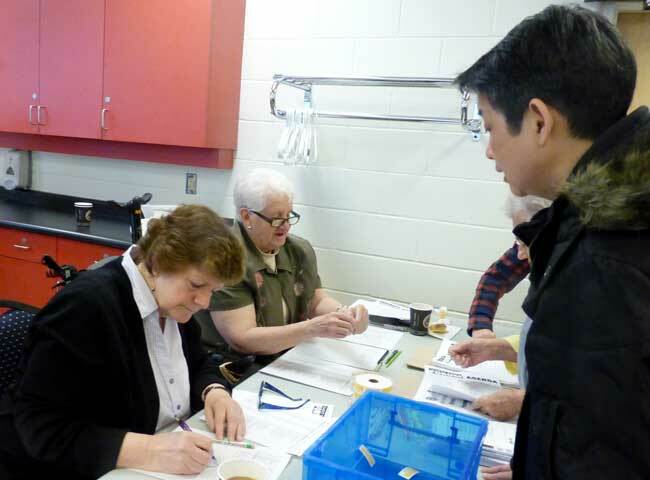 Burlington Transit’s report card improved slightly over the past year and about 100 transit users and community activists left the fourth annual Transit Users’ Forum at the Seniors’ Centre Apr. 21 with a renewed sense of optimism for the future of the city’s bus system. Burlington Transit Director Sue Connor told the meeting she is committed to seeing steady improvement in service and is hoping for support from City Council. Burlington MPP Eleanor McMahon outlined millions of dollars in extra provincial funding for the system. 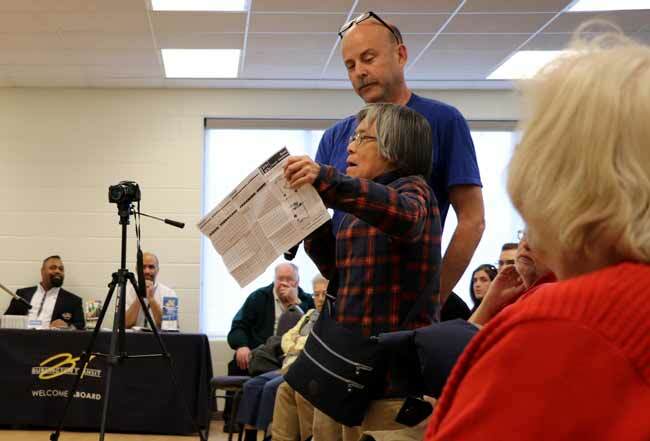 Participants also got the chance to question Connor and a panel of community transit advocates at the forum, sponsored by BFAST (Burlington for Accessible Sustainable Transit) and 13 other community organizations. BFAST Chair Doug Brown said new federal and provincial funding for transit doesn’t let City Hall off the hook in paying its fair share for transit. 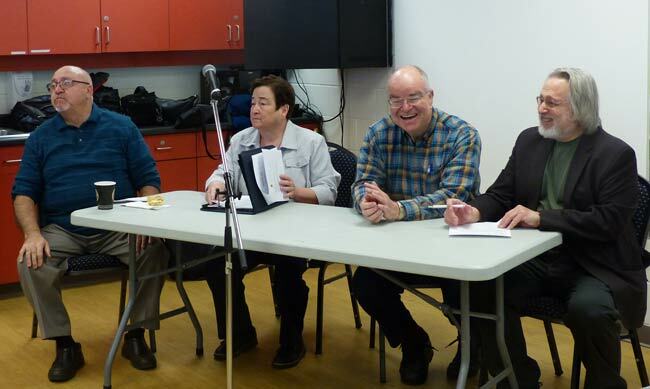 Longtime BFAST volunteer Gareth Williams, a candidate for Ward 3 in the municipal election, moderated the panel discussion. Drawing on her experience as Director of Brampton’s system, Connor said Burlington Transit would investigate establishing a grid system of routes that she said would get passengers to their destination more quickly. “Although there’s still a lot to do, I have to recognize that City Council made a big investment in transit in 2017 and 2018. And I think that was a remarkable step and hopefully we can keep that momentum going,” she said. Connor praised BFAST for organizing the forum. “Their insight into transit in Burlington has certainly helped me, in my early days, to see what some of the issues are,” she said. BFAST Chair Doug Brown urged Burlington’s city council to do its part by raising per-capita funding above its current rank of lowest in the GTA. Burlington MPP and President of the Treasury Board Eleanor McMahon said the government was reversing a previous pattern of downloading responsibilities and costs to municipalities. 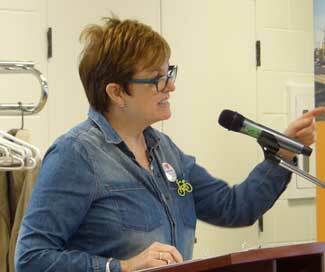 Burlington MPP Eleanor McMahon reviewed new federal-provincial funding for transit. “It’s important that we continue to make strategic investments in transit infrastructure in Burlington,” she said. “Burlington will receive an extraordinary $45 million in public transit funding” as a result of a federal-provincial agreement detailed in an announcement a week ago, she said. Recent school closings will also affect demand for transit, warned a trustee for the Halton District School Board. Connor reported that Burlington Transit was now meeting regularly with school-board transportation officers on issues like these. 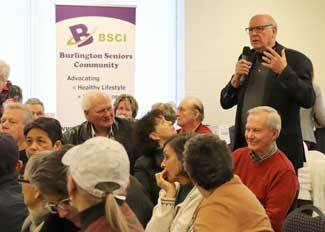 Jim Thurston, chair of the Burlington Seniors Advisory Committee, asks a question during the panel discussion. The bus bays on the north side of the Burlington GO station will finally move back to the south in 2019, Connor reported. But designers of the station renovation left room for only six bays on the south side. “I have not been able to get an answer from Metrolinx” on the reason for the shortfall, she said. Burlington Transit is studying construction of a bus bay on Fairview St., a short walk to the station, but final plans would not be ready until 2019. The downtown terminal will have improved hours, from 8am to 6pm on weekdays and 9 to 6 on Saturdays “and we will not be closed a half hour for lunch,” Connor said. The new hours will be effective in May. Ward 2 Councillor and mayoral candidate Marianne Meed Ward brought greetings from City Council. Transit users applauded the news that a deal is being finalized to make Presto fare cards available at seven Shoppers’ Drug mart locations across the city. And they welcomed the announcement that the downtown terminal will be open longer and will not be closed during lunch hour. The marks on this year’s transit report card, decided by the roughly 100 people in attendance, improved slightly from last year. 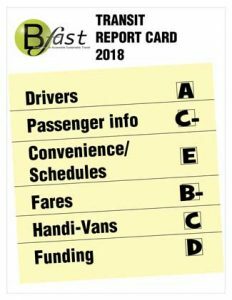 While the system’s drivers once again got an A and fares got a B-minus, passenger info got C-minus and convenience and schedules got an E. The BFAST Steering Committee awarded a D to City Council on the budget issue, saying last year’s infusion helped but more commitment is needed. 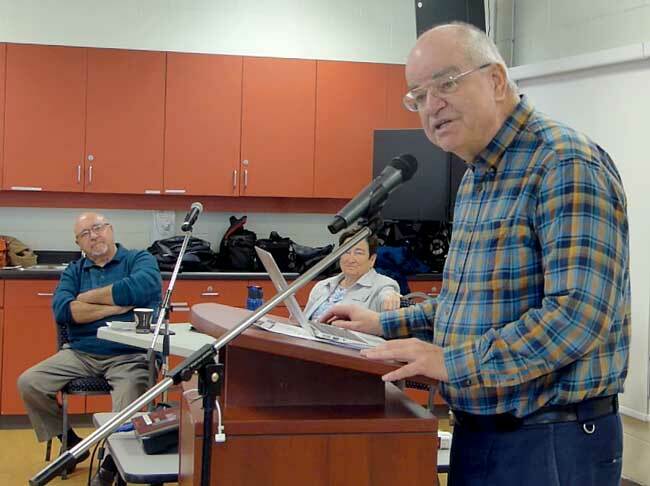 Those were among the highlights of the half-day meeting, which saw a number of provincial and municipal candidates in attendance. 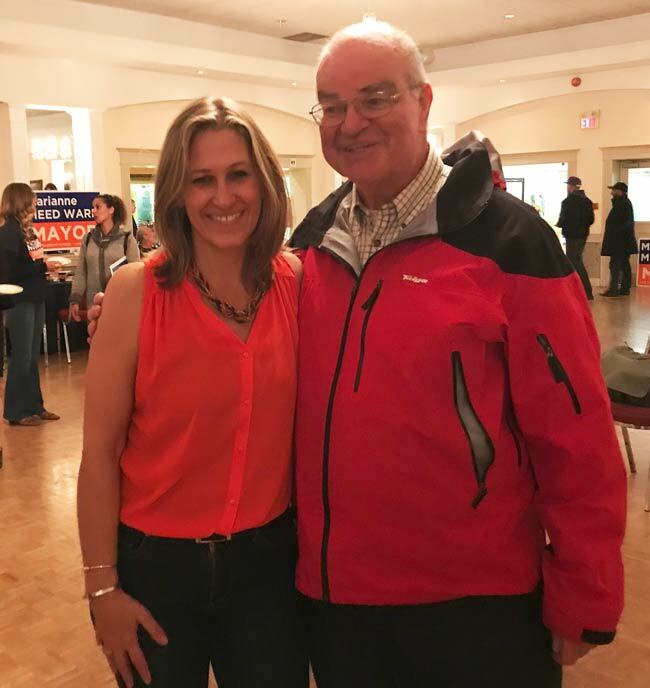 Ward 2 Councillor and mayoral candidate Marianne Meed Ward welcomed participants in the absence of Mayor Rick Goldring, who was out of town for the event. Former MP and current mayoral hopeful Mike Wallace also attended. 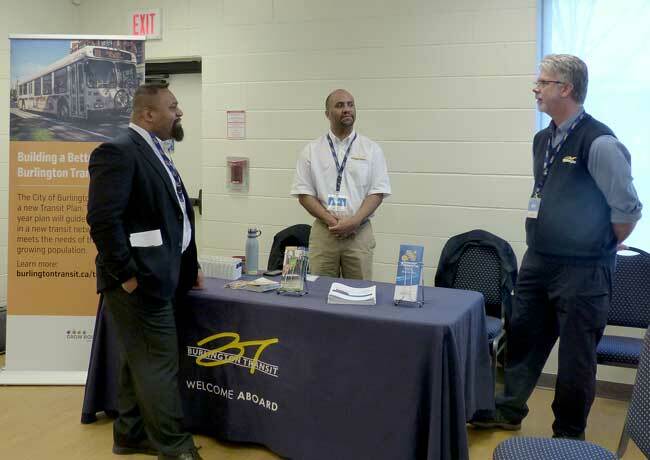 Burlington Transit donated door prizes and had drivers and staff on hand to answer questions. Volunteers Heather Thompson (left) and Glenna Cranston registered more than 100 attendees. This entry was posted in BFAST News on April 23, 2018 by Collin Gribbons. Visit again for further details about our agenda and speakers. Once again, we expect a large turnout, so please register early! Please download our print or online posters and distribute to your friends and neighbours. Our high-resolution print poster can be photocopied and distributed. Prints well in b&w or colour. Our online poster features an active registration link. Ideal for distribution via email or social media. This entry was posted in BFAST News on March 7, 2018 by Collin Gribbons.